Nigeria's Football Federation (NFF) is seeking friendly matches for the Super Eagles after English side Arsenal pulled out of a pre-season match. The setback has left Nigeria scrambling for games ahead of the 2013 African Cup of Nations qualifier against Liberia. NFF president Aminu Maigari expressed disappointment at the challenges of finding top friendlies for Nigeria. "We were looking forward to playing Arsenal and our players and coaches were full of confidence," said Maigari. "Unfortunately, the club pulled out and we are trying to get opponents for the Super Eagles at a short notice." The NFF president feels that the situation has been compounded by Fifa's decision to move the window for international friendlies from August to September. "Sadly, the Fifa window being extended backwards has taken its toll too and we are left planning for friendlies with locally-based players now," he told BBC Sport. Nigeria travel to Liberia for the first leg of their decisive Nations Cup qualifier on 8 September, ahead of hosting the Lone Star for a place in next January's finals a month later. There is a possibility that John Mikel Obi could play in those ties, after Nigeria coach Stephen Keshi dismissed insinuations that he has a problem with the Chelsea midfielder. Mikel has not played for Nigeria since Keshi took over last November, with former Super Eagles captain Jay-Jay Okocha recently pleading for Mikel's international recall. "Yes, we may have played some games without Mikel, but he has always been part of the team and I must tell Nigerians that I have been in touch with the player," he said. "There are other players too who have not had chances like Obinna Nsofor, Emmanuel Emenike, Obafemi Martins and Chinedu Obasi. Gradually we will give everyone a chance and not just Mikel Obi." Mikel has not played for Nigeria under Stephen Keshi who took over last November. As he prepares to fulfil his task of steering the side to the 2013 Nations Cup, Keshi is hoping that a friendly will materialise on 15 August - with a NFF official being quoted as saying that talks are ongoing with Guinea, Sudan, Gabon and DR Congo. Maigari confirmed the talks but refused to be drawn into likely opponents. "We are looking at the friendly proposals we have so far because they need friendlies before travelling to play Liberia, who are as good as other top sides in Africa. "We will ensure that we get matches for the team to prepare adequately for the Nations Cup qualifiers." 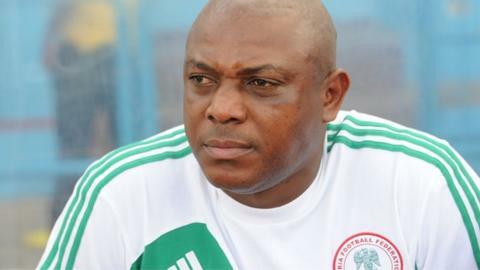 Keshi aims for "strong Nigeria"
Read more on Keshi plans to build "strong team for Nigeria"